Thanks to our very first article sponsor Wendy Watters, who runs Camps for the Modern Goddess. These weekend retreats for women enable you to dive deep beneath the skin to rediscover the ‘real’ you’. Find out more at mycoachwendy.com.au. I’ve done one and they rock! Who or what inspires me? My mother, she is the most courageous person I’ve ever known. Best advice: Don’t ever give up. We all have incredible inner strength: Until you are tested, you will never know how strong you can be. It’s 1998 and Carina Hoang has returned to the place of her nightmares. She thrashes through the jungle, the guide hacking through the fortress of trees with a machete to reveal long-forgotten graves. These overgrown tombs mark the bodies of Vietnamese refugees who fled in their hundreds of thousands after the Vietnam War. Eventually she finds it – the grave of her cousin who died here nearly 20 years before. News of the find spreads. Pleas from other Vietnamese families trickle in. Can Carina help find the graves of their loved ones? Now, each year, Carina returns to tiny, remote and little-known Indonesian isles to search for more graves. She’s made seven trips, discovered more than 100 graves and taken 20 families to the final resting place of their loved ones. She does it out of her own pocket, in her own time. Why does she return to this place of the dead? Because she was very nearly one of them. Carina searching for refugees’ graves. Rewind to 1975 and 12-year-old Carina’s life had turned upside down. Her dad, a former police chief in South Vietnam, had disappeared. Some people whispered that he’d killed himself. Others said the communists had captured or killed him. Still others said he’d escaped. His military involvement during the war meant he was a wanted man by the communist government. Panicked, Carina’s mum destroyed all evidence of their former lives. She amassed everything – marriage and birth certificates, photos, papers and burned them. She gathered all her treasures, all the gold this once comfortable family had accumulated, and hid it in jars and toys. They lived in fear that each knock on the door was a communist coming to take them to a South Vietnamese ‘re-education camp’ for political prisoners. They knew there’d be no trial, no sentence. They were forbidden from working or passing their school tests, yet selling on the black market was illegal. They knew hundreds of thousands of city people were being rounded up by the truckload and dumped in ‘new economic zones’ – uncultivated fields with no shelter, no food – and told to forge a life for themselves. Then, in 1978, the war with Cambodia broke out. Carina’s mum knew her children would be drafted as soon as they reached 16 years. Carina’s mum first organised for Carina’s older sister and younger brother to escape – they fled for safety in Malaysia aboard a small fishing boat were they hid in a hull packed with ice. Several months later it was Carina’s turn. She was 13 years old and would have to take her nine-year-old brother and eight-year-old sister with her. Carina’s mum would remain behind with her two youngest children. 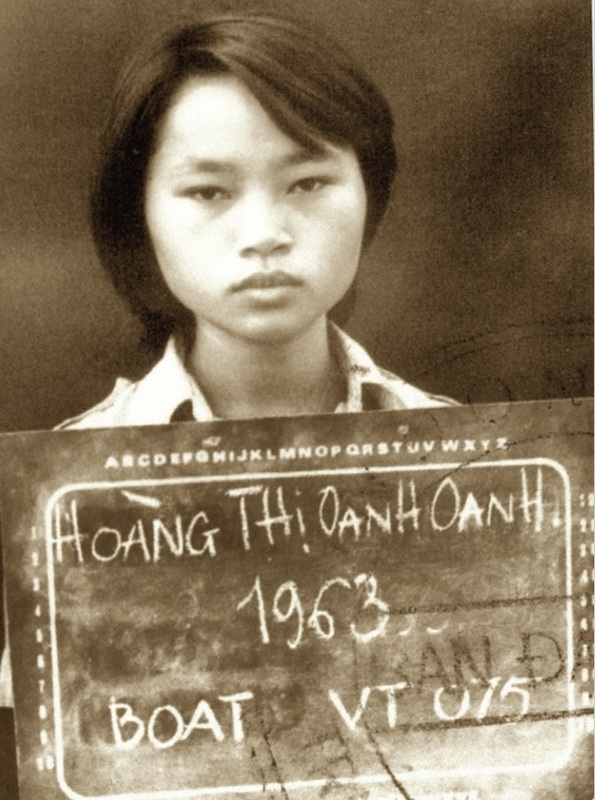 Carina in 1979 when she fled from Vietnam. First, Carina attempted to flee on the same boat on which her siblings had escaped earlier, but someone tipped off the police and the boat left without Carina. Next Carina and her younger siblings joined a group of escapees who fled via train, on foot and in a truck, dodging military checkpoints, to a secret beach where they waited for small taxi boats to ferry them to a bigger vessel. But when the taxi boat did not return after a second group had been transported they knew something had gone wrong. They fled into the forest but police caught most of them. Carina and her siblings were among the few who escaped. By January 1979, they were ready to try again. But they’d been lied to – after handing over her mother’s gold to the people smugglers, Carina discovered the boat was being rebuilt and not ready for the journey. Carina was stuck hiding in the country, hundreds of kilometres away from her family. A month later, Carina was returned to her mother, the gold replaced with nothing but a set of earrings. They fled into the forest but police caught most of them. Ever resourceful, Carina’s increasingly desperate mother wrangled another escape opportunity. Carina and her siblings would pose as Chinese Vietnamese who were being exiled from the country. In May 1979, a by then 16-year-old Carina and her younger brother and sister boarded a 25-metre-by-five-metre wooden boat, along with 373 others, including 75 children. The boat operators forced the refugees into the bowels of the boat where they’d remain for seven days. The first night a storm struck and the terrified passengers became violently ill. With no room to lie down, let alone find space, it wasn’t long before they were covered in vomit, urine and faeces. After recovering from the storm they were then attacked by Thai pirates. They’d heard stories of such attacks – babies thrown overboard, men murdered, women raped – so the women and children rushed to cover themselves with excrement in a bid to deter would-be attackers from approaching them. By the third day the boat approached Malaysia and spirits soared – it seemed freedom was in sight. But Malaysia had just introduced a ‘push back policy’ towards boat people. They’d been instructed to shoot to kill to deter the refugee boats. Carina says the Malaysian police boarded her boat, towed it back out to sea, stole the refugees’ valuables, then cut the rope and warned them never to return. The boat operators decided to try for Indonesia. But by the sixth day they’d run out of food and water and people started to die, their bodies tossed overboard. After seven days at sea, the boat reached a small island fishing village in remote Indonesia. The boat operators sank the boat so they could not be returned to the ocean. Ten days later the local government put them aboard another wooden boat and said they’d be taken to a refugee camp. Instead they were dropped off on a remote island beach and left to survive in the jungle. Instead they were dropped off on a remote island beach and left to survive in the jungle. At first they refused to believe it. Surely the boat had gone to get fuel before returning to take them to the ‘real’ refugee camp. They sat on the beach – a great ocean spread out before them and dense jungle behind them – and waited. Afraid of encountering wild animals in the jungle, they remained on the beach shivering through a monsoon storm that night. By day they’d keep their eyes glued to the ocean for signs of a returning boat. After several days braver folks started venturing into the jungle. It turned out two other boatloads of refugees had already been dumped there. Eventually villagers arrived, offering shellfish, fruit and vegetables to the starving refugees in return for their valuables. Then another boatload of people was abandoned there, and soon another. Food became scarce. Malaria and diarrhoea broke out. People began dying. Carina and her siblings sat alongside a 21 and 23 year old couple with an eight-month-old baby. It wasn’t long before the baby died. “I remember holding this dead baby in my arms. I washed her and changed her. Every day someone died,” Carina says. After three months on the island a Red Cross helicopter arrived, distributing medicine, food and plastic sheeting for shelter. But the trio would endure another seven months on this forgotten isle before they were processed as refugees and flown to Philadelphia to forge a new life. Carina threw herself into her studies and excelled. She earned a scholarship to university. She found work. Yet images of the family left behind haunted her. By this stage she knew her dad was alive, but in prison, and her mother had been imprisoned for helping her children escape. Her grandma had cancer – if she died, what would happen to her two youngest siblings left behind? As Carina forged a career for herself, she was invited to return to Vietnam for a research project – a trip in which she’d meet her Italian-born husband, who had grown up in Australia. The duo was married and returned to the States before moving to Australia. 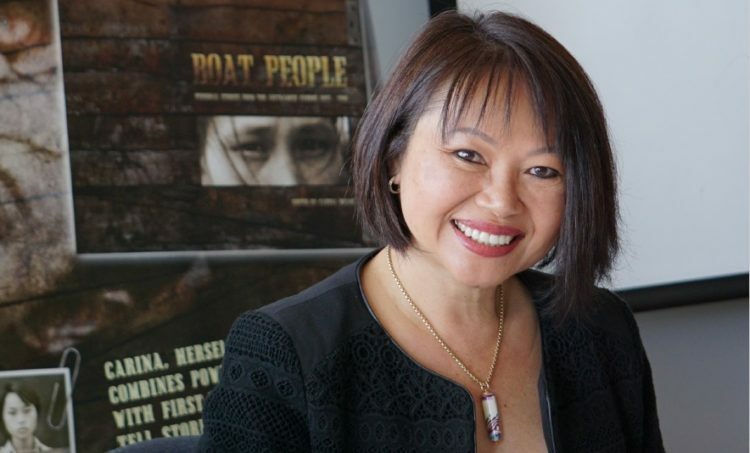 Here Carina published her award-winning book ‘Boat People, personal stories from the Vietnam Exodus’, published books for others, won a scholarship to study a PhD at Curtin University on the history of refugees in Hong Kong and was inducted into the WA Women’s Hall of Fame as one of the state’s most inspiring women. And it was from here that she has made her return trips to the desolate isles that haunted her dreams, to search for Vietnamese refugees’ graves. Together with her brother and cousin, Carina began planning her return to Indonesia to find her dead cousin. She knew he had died on an island called Terampa. But in a country with around 18,000 islands, only a third of them named, it seemed impossible they’d locate this one. It didn’t appear on maps, no-one they questioned had heard of it. No matter, they’d make the trip regardless. Someone overhead them talking at the Indonesian consulate in Singapore and thought the island may be part of the Anambas archipelago. So they flew to one of the biggest islands in the group. Based on rumours and vague directions, they caught a ferry that would bring them closer to their intended destination. Next they found two pilots who agreed to fly them still closer to Terampa, but the pilots would only take money for a one-way ticket as they couldn’t be sure they’d be returning. After landing, the captain of a navy boat heard of their quest and offered to take them direct to Terampa. Finally there, the trio hiked into the jungle and began their search. 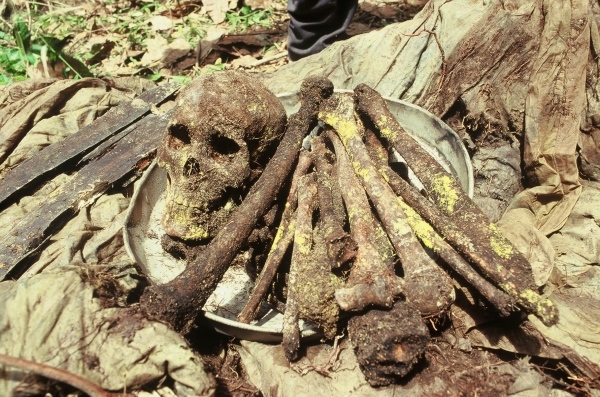 The first day they found many graves, but they all appeared to be Indonesian. The next day a local farmer offered to help. He knew of eight graves that could be Vietnamese. With hundreds of graves strewn across the island, they decided to start with these eight. But they only had permission to excavate one grave – and if it wasn’t their cousin they’d still have to take the remains back with them. It seemed impossible they’d find him. After hacking through the jungle to reveal the abandoned gravesites, the farmer asked which one they’d like to excavate. Carina, her brother and her cousin each privately considered which grave to try – by chance they’d all picked the same one. Here was their one chance to find their lost cousin. They knew they’d be able to identify their cousin because he was buried in a wooden coffin – his mother had been gifted wood by fellow refugees who no longer needed it as they knew they were evacuating the island the day after Carina’s cousin had died. They didn’t believe anyone else would have been buried in a coffin. Her cousin had also been wrapped in a military blanket before burial. The find made Carina think of those she’d come to know on the island on which she’d been stranded – those like the eight-month-old baby she’d cradled and helped bury all those years ago. But she had no idea where that island would be amidst Indonesia’s island-studded seas. It just so happened that the captain of the ship that had transported them to Terampa knew of the island where Carina had nearly died – Kuku Island – and it wasn’t far away. He offered to take her there the next day. Guided by the spirits of the refugees who died in their desperate bid to escape, Carina is determined to continue her annual pilgrimage to these remote Indonesian isles to reunite Vietnamese families with their long-dead loved ones. For more information and to order Carina’s book, visit the website www.carinahoang.com.